Hello and welcome to this Episode #24 of the Mother’s Quest Podcast. I’m so honored to bring you this important and powerful conversation today with Elizabeth Cronise McLaughlin, who through her daily Resistance Lives on Facebook, guides thousands of us with a voice of reason and optimism during the twists and turns of today’s political landscape. Elizabeth is also a mindful mother. No matter how full her life gets leading women around the globe or fighting for our democracy, she prioritizes bringing presence and focus to her two children, both under the age of 5. In this episode, we talk about how Elizabeth grew up in a very progressive community and had a strong intuition she would make a massive difference in the world. She attended her first protest when she was just 15 years old and now she’s leading a new awakening in activism – one that challenges her over 20,000 followers, of which I am one, to take daily political action, to truly listen to one another and to others with differing perspectives, and move forward as intersectional feminists, shoulder to shoulder. We also talk about the new heroine’s journey where the heroine brings back the lessons learned along the way, her words of wisdom for me as I set out to raise awareness and create space for uncomfortable but important conversations about race, how we can “bear witness” for those who have different experiences than our own, and Elizabeth’s challenge to all of us to use our voice for change. We packed so much depth and wisdom in this conversation, including the first ever lightning round exploration of the E.P.I.C. Guideposts. 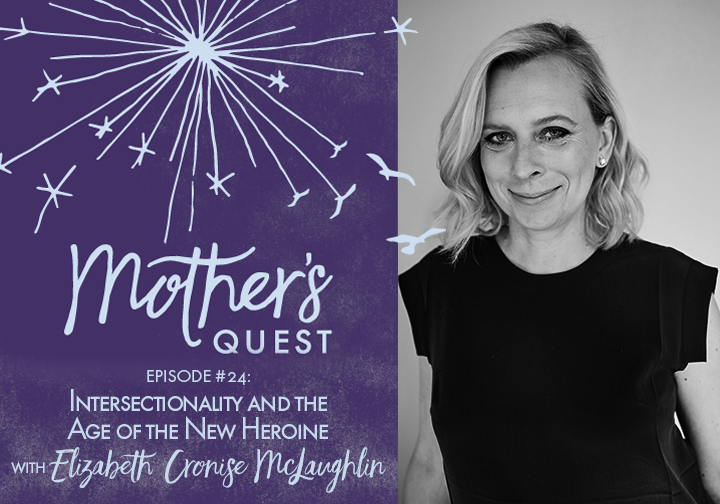 I look forward to hearing about the ways in which this episode will inspire you and invite you to join the Mother’s Quest Facebook Group to share with us and participate in a special Q & A on Thursday, August 3rd at 11:30 am PST with activist, leadership specialist, and former NAACP Vice President Chandra Brooks. I left this conversation feeling more inspired than ever myself to step up and into the role of the New Heroine during these times. Moved by my experience with Elizabeth, I commit to daily political action, to stretch myself to have brave conversations and use my voice for change, to truly listen to others, and to consciously cultivate this Mother’s Quest community I’m growing. Elizabeth asks us to think of ways we can stretch ourselves, outside of our comfort zone, to use our voice for good. And believe that we can change the world by making a difference even in one person’s life. Elizabeth’s unique upbringing in progressive New Hope, Pennsylvania where 50% of the population was gay and there was a strong counter-culture. The necessity of letting go of our anger, being willing to listen, and leading from a place of healing to hold a vision for and create the holistic society we seek. The feminine energy and ongoing cyclical nature of the New Heroine’s Journey. The massive acceleration of purpose and mission brought about by our current political situation. Intersectionality within the Resistance and how women with privilege need to investigate our own internal biases so we can create a culture where everyone is safe regardless of our race, gender, sexual orientation or immigration status. Feedback for me on an initiative I’m exploring to raise awareness and funds for Black Lives Matter; the importance of listening and “bearing witness” for communities who have different experiences than ours. The profound moment of reconciliation at the Gaia Lead Conference that had everyone in tears. The importance of consciously cultivating the businesses, work-places and communities that represent all of us and how even the smallest gestures of reaching out can really make a difference. A lightning round version of how the E.P.I.C. guideposts are showing up in Elizabeth’s life and the lessons she’s learning along her heroic journey. Q & A on Activism and Intersectionality – Let’s continue this conversation inspired by Elizabeth’s episode with a Q & A in the Mother’s Quest Facebook Group with activist, former NAACP Vice President and leadership specialist Chandra Brooks , Thursday, August 3rd at 11:30 am PST. Click link to join the group. Visit the Website – If you haven’t yet visited the website, head over to www.mothersquest.com to explore some of the ways you can get more connected. At the site, you can sign up for our email list (to get show notes delivered to your inbox and our new “Mothers on a Quest” features), click the link to join the Facebook group and press record to leave a voice message for me. You can also download the FREE Live Your E.P.I.C. Life Planning and Reflection Sheets.